Rumor grew of a shadow in the East, whispers of a nameless fear, and a Ring of Power perceived. It’s time had now come….. Rings of Power people. They’re not good. 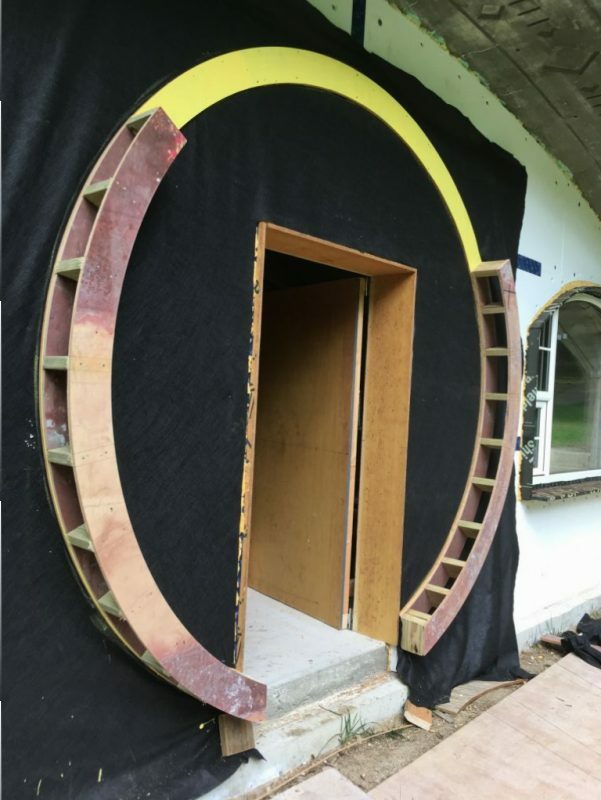 And welcome once again to the Hobbit Hollow Construction Blog……where it seems we talk a lot more about other things than construction. Let’s see where this post takes us shall we? Oh yeah and thanks for stopping by. So as I was saying last week we had a little incident over on our moped tour of Block Island. It really wasn’t an accident. I wanted to take a break and lay down on the side of the road next to my wife and look at the beautiful blue sky. It just would have been a lot nicer if I had done it in a different way. You know like pulling off to the side of the road. Accidents are always kind of a surreal experience. The worst part of the whole thing was knowing that my children witnessed the incident unfold. At least Jude did. Why did it have to be Jude? The Editor and I are both lying there on the ground checking to see if all of our body parts still function and then knucklehead Jude pulls up laughing hysterically. “You should have seen the way you guys flew off the bike!!! !” I mean our son doesn’t even ask if we’re alright. Or have a look of concern on his face. He’s just laughing at the side of the road. Kids. At least the stranger who stopped asked, “Are you okay?” And I didn’t answer him cause to be honest I didn’t know if I was. Three weeks later and I actually finally do feel about 97%. The Editor took it really well though I have to let you know. She was laughing almost as much as Jude was. Accidents. Yeah. The main thing is nobody got seriously hurt. It was a close one though. I’m just so grateful that that Mother-in-Law of mine wasn’t there. I don’t know if I could have taken her digs at me if she actually got to witness my stupidity. That would have been bad. Really bad. 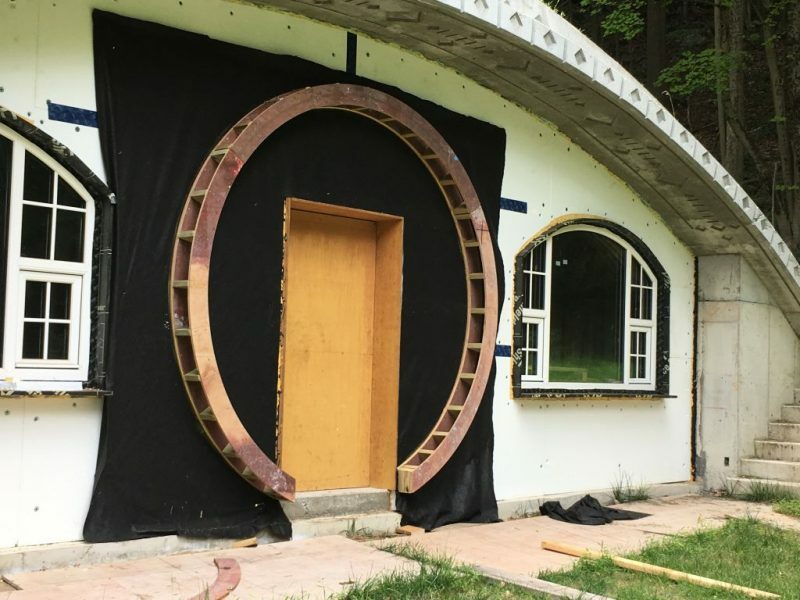 Let’s get back to Hobbit houses though shall we? So yeah the walkway path up to the roof. I didn’t really show a very good picture of it. Terence and his friends finished the rough part before he went off to college. Check it out. Walkway path to the roof patio roughed in. So the idea here is to bring in the excavation contractor and fix it nice. 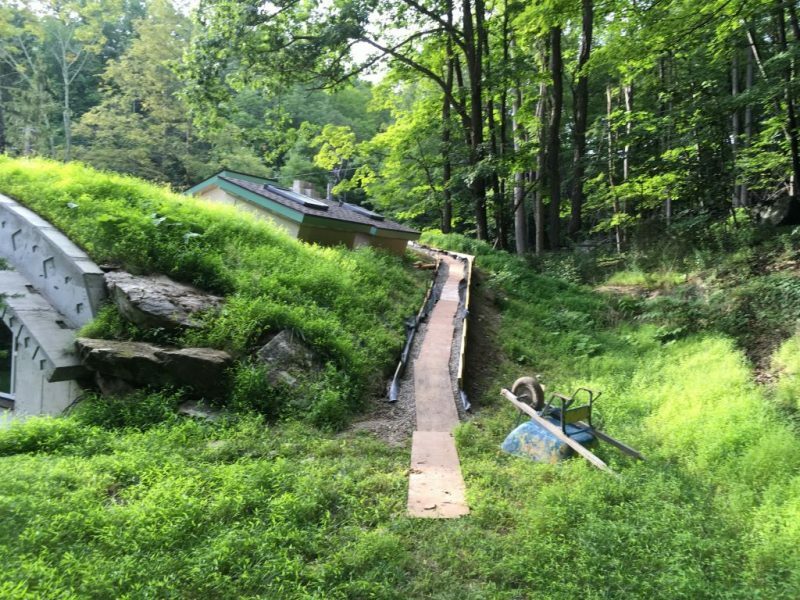 I think if he uses some of the stone on the property and brings in a little topsoil he can make this really look nice. So the main focus of this weekends work was to get the exterior trim framing in place. This is really no simple task. So the controlling factor here is the stone that we are going to put underneath the windows. Let me show you what I mean. 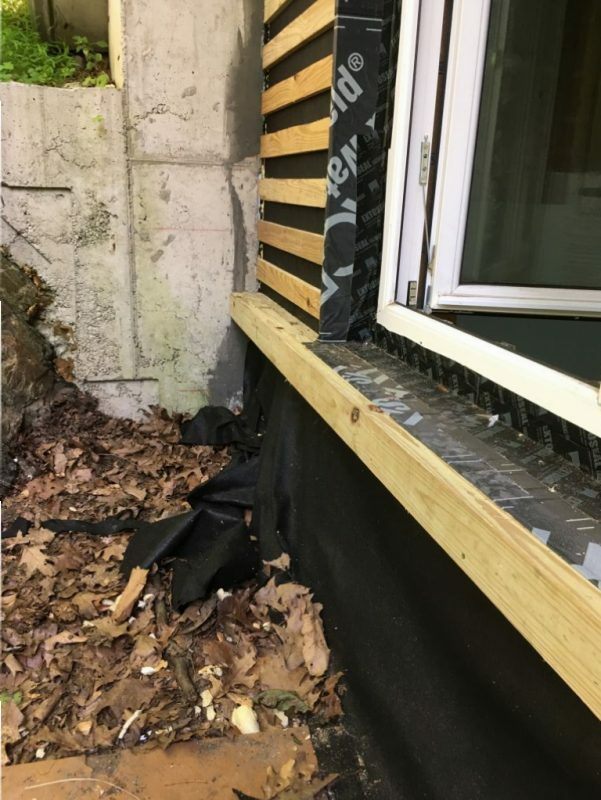 2×4 ledger underneath the bedroom windows. So what I did here was attach a series of three pressure treated 2×4’s to the wall using various sized screws. This creates a shelf on the outside of the house. Underneath that shelf will be stone. Above the shelf will be Cedar shakes. So three 2×4’s creates a 4 and a half inch void for the stone. Which should be plenty. Therefore the door trim has to clear this shelf and the trim that goes with it. The first thing I had to do was create a circle template. Actually two templates that I could sandwich a two by 6 between. This was done using the router and cutting out the plywood which I had done previously. Remember I had one circle already secured to the outside of the house. 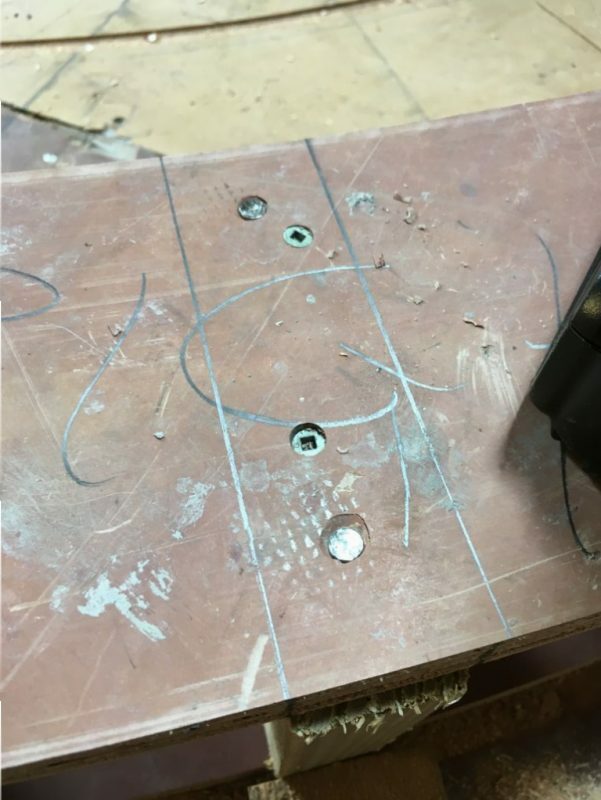 Once I had both pieces cut out I put them on top of each other and then used a strip of two by material to layout where the studs were going to go . Check it out. After this I cut my pressure treated 2×6’s to the correct length and put them into place. Layout 2×6’s on layout marks. 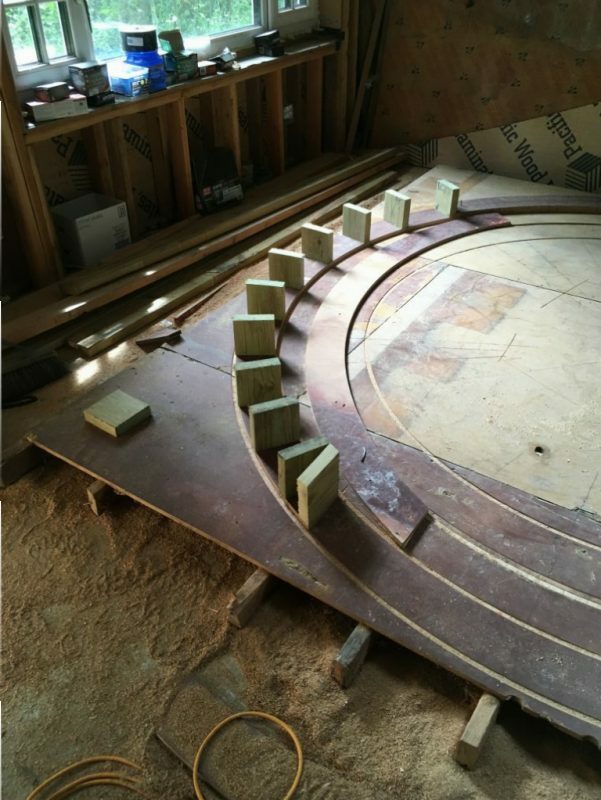 Take the next piece and lay it over the top and nail it in place. What I did was nail it with 8 penny commons first and then I added two 2 inch decking screws to each side so the plywood would never be able to pull away from the 2×6. It worked really well. This thing is solid. Added deck screws after the initial nailing. So here’s how it shaped up. 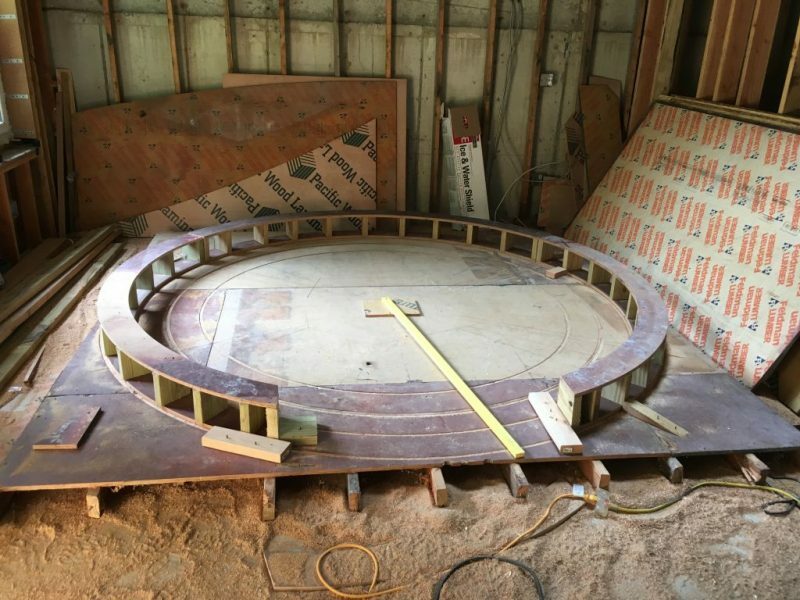 First template nailed into place. I made this thing in three separate pieces. This way I would be able to lift it by myself and get it out the door. Also once the first piece was on I just flipped it over and screwed the other sheet of plywood right to the 2×6. 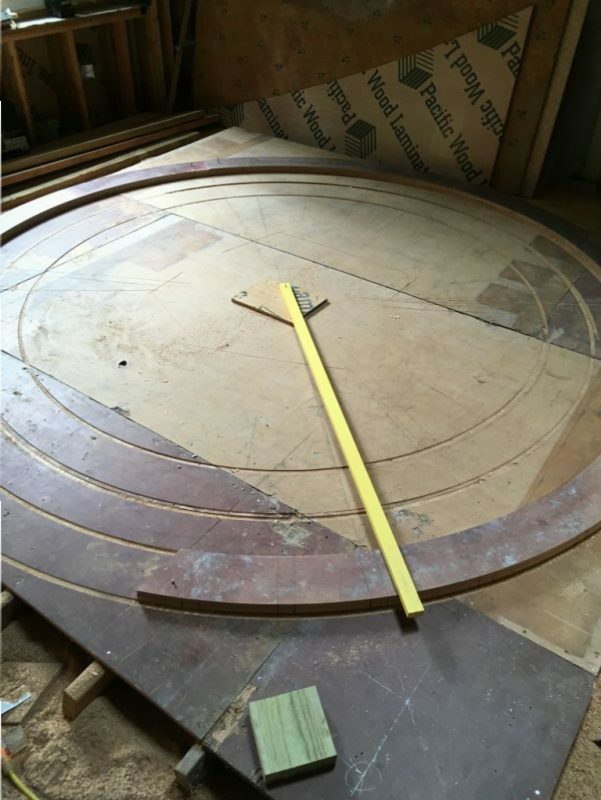 After that it was a simple matter of taking it one piece at a time and securing it to the original template that Terence had affixed to the house previously. Two of the three pieces installed. The yellow is the original template. Door trim framing is now complete. This will add a layer of depth to the house. What I have to do next is laminate plywood onto this frame so I can finish the styrofoam on the outside of the house. I’m going to use 1/2 Azek for this. It will last forever. A couple of other things of note. Picked up Terence from Manhattan College Friday night. It’s Labor Day weekend here in the states and him and his high school friends are going to meet at Syracuse University. 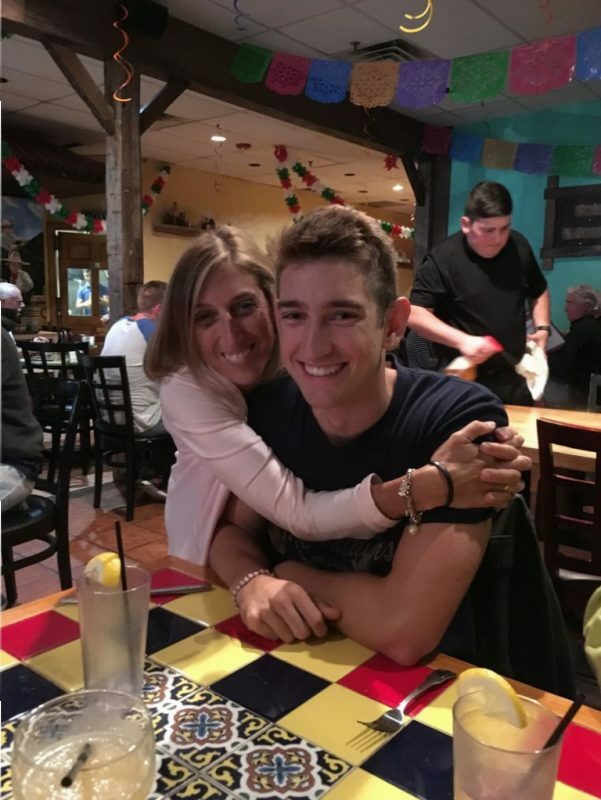 We meet the Editor at Fiesta Mexicana in Brewster for a little reunion so he could tell us about his adventures. Did any of you get to see the eclipse? Terence’s teacher got the viewing glasses and gave them out to a bunch of kids. He brought a pair home for the Editor. They said it was really cool. I didn’t think that you would be able to see much being that we were not in the direct path. They were saying that we were in a 70% zone. I was at work at the time. It was as if a cloud passed by for the most part. They said with the glasses you could really see what was happening. Supposed to get another one in 2024 I think that passes across the northeast. I’ll be prepared next time. Enjoy your Labor Day people! See you next time. Is This Okay????……..Hey! Why Don’t We Rent Mopeds!!!! Hey John! Thanks for the info on Forest Gully. Pretty interesting. I haven’t had time to really look at the site but like you were saying it doesn’t look like these things were made to endure. They might have done a few things that we can’t see. You know like wrapped the whole thing in Grace ice and water shield. That would definitely help extend the life of the house a bit. The issue of the code is a good one as well. Maybe that’s part of their game. Keep it simple and don’t run the cost up. Nobody’s checking anyway. I guess in a sense it’s almost like putting a tent up in your backyard and doing vacation rental by owner. As you can tell I’m not into that. Thanks for writing and I hope you’re enjoying the end of summer! I’ve got to say your a good builder,everything you do is just perfect,so why do you have to go ride a moped? at which you are not so good,so stay off them,and if you feel the need for danger again don’t take my baby on the thing with you. That picture of my baby and her baby is great. I bib see the eclispe it was really great I even got Luke to see it.I hope I’m still around for the next one. Yeah. Definitely not doing another tour of Block Island anytime soon. You should try it though. The hairpin turn over by the Spring House is really exhilarating. Just keep it a tad under 35 mph. You’ll be fine. Trust me. Your life insurance is paid up isn’t it? Bye the way I hope you’re sleeping better.